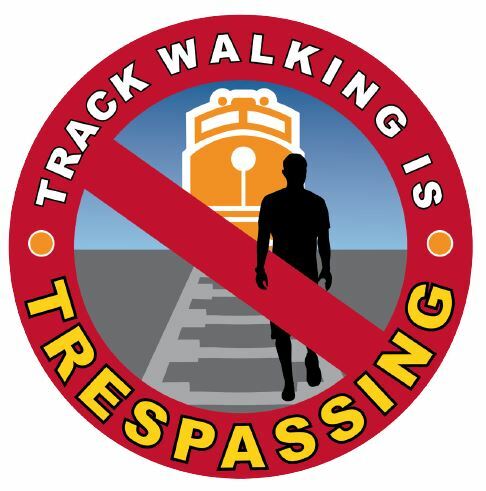 Railroad tracks are private property, not public trails. It’s illegal to walk on the tracks unless you’re at a designated crossing. It’s extremely dangerous to walk, run, or drive down the railroad tracks or even alongside them. Trains travel in both directions and at all times of day and night. You never know when a train might be heading your way. It’s especially dangerous when you’re wearing headphones or earbuds and can’t hear the signals or train horn. Train tracks and railroad trestles are not the place to hang out, take selfies, go for a day hike, or use as diving platforms into the water below. People have died because they were looking for a shortcut, a secluded fishing hole, or somewhere to have fun. Your life is too important to risk because you’re seeking an out-of-the-way place to kick back. Stay off the tracks and stay safe. Other people might think it’s okay to be on the train tracks when they see your photos on social media.